The leadership and family members of the Indigenous People of Biafra (IPOB) worldwide wish to raise alarm once again over the continuous and flagrant abuse of judicial process through incessant adjournments of cases involving IPOB by Binta Nyako and other judges in Nigeria. IPOB intelligence unit have uncovered plans by Justice Binta Nyako of the Federal High Court 3 Abuja, Attorney General of the Federation through DSS lawyer Mr S. Labaran who incidentally doubles as the government prosecutor, about their intentions to adjourn the upcoming case between IPOB and Nigeria government on 20th of February 2018 to yet another unspecified date. With this ongoing plan to adjourn this case yet again, it goes to confirm that Nigerian government and her DSS agents have no material evidence or witness to prove their case of bogus treasonable felony allegations and charges against IPOB. Aso Rock and their secret police DSS, are using protracted adjournments as a tool to punish those they feel are enemies of their government. A legitimately held view of the right to self determination as espoused by IPOB, in the eyes of the Nigerian judiciary, is a crime worthy of indefinite detention at the pleasure of the Nigerian president, in a supposed democracy that practice the rule of law. It must be noted that there is existing court order requiring DSS to release Mr. Bright Chimezie Ishinwa since June 2017, which Lawal Daura the Director General of DSS has continued to disobeyed till date, without any cogent reason or argument. The serial flagrant disobedience of this particular court order and many more by DSS is proof that today's Nigerian judiciary is firmly in the hands of DSS and other government agencies. They are anything but independent. Humanity must take note of the fact that Nigerian judiciary is not independent and as a result of which thousands of innocent citizens that hold contrary political opinion to this Buhari regime are languishing in detention across Nigeria for no legal reason. In Nigeria today, unless you are a certified friend of this APC government, you can never get justice from the courts. 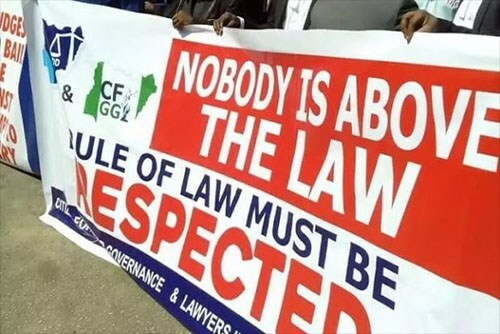 Going by the provisions of the laws of Nigeria regarding the charges for which they are being arraigned, both David Nwawuisi and Benjamin Madubugwu have completed their sentence had they been convicted of the crime for which they are being tried. These two individuals have spent more time in prison than people convicted of similar offenses, still their trial is yet to commence fully due to lack of evidence and inability of DSS to open their case. This is what thousands of families are being forced to endure across law courts and prisons in Nigeria. There is no greater example of man's inhumanity against man. IPOB will not tolerate any further adjournments or else the Nigerian judiciary will be dragged through the mud before the eyes of the civilised world. We would devote every human and material resource to exposing the fraudulent practices and tons of miscarriages of justice carefully concealed and hidden from public knowledge. This is an exercise we are confident the Nigerian judiciary as presently constituted will never ever recover from. All we are demanding is that the case proceed on the 20th of February 2018 as scheduled for the world to appreciate the level of suffering endured by Biafrans for merely expressing boldly who they are. We know, for the purposes of all IPOB cases, that the Director of Public Prosecution (DPP) and Directorate of State Security Services (DSS) are one and the same department persecuting IPOB family members. That is why a DSS lawyer Mr S. Labaran an employee of DSS with their legal department, is today the chief government prosecutor in this trial involving our leader Mazi Nnamdi Kanu, David Nwawuisi, Benjamin Madubugwu and Chidiebere Onwudiwe. This illegal arrangement of the accuser being allowed to become the prosecutor is most distressing. No civilised country or society with any shred of regard for democratic tenets will condone such repressive arrangement. Without prejudice, we are calling on the Nigeria Judicial Commission NJC, judges, including the Chief Justice of the Federation, to sit up and do the needful for the whole world to see how they handle case involving IPOB. The legal establishment should not allow the DSS orchestrated blackmail of Justice Binta Nyako, whose husband and son are being held to ransom by the presidency, to determine the outcome or direction of this case. 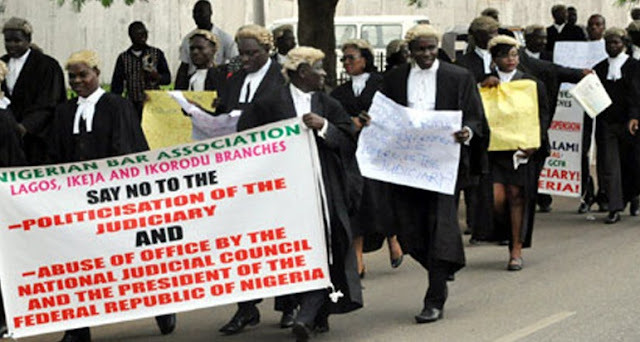 Unless the judiciary in Nigeria does the right thing by following laid-down law, rules and procedure in this case and others, IPOB will meticulously and systematically destroy what is left of the battered image of the Nigerian judiciary to the extent that Nigeria will be seen and regarded by the world as the lawless country that it is. If the NJC is in doubt, they should ask Lai Mohammed about the potency of IPOB campaigns.